You are running an online store and cannot decide on the new design solution? You’re looking for ways to improve the conversion rate in your e-shop? You follow the latest design trends and are interested in the most up to date tendencies? Then, the infographic by The Deep End web design studio is definitely worth your attention. There are no trifles when it goes about business prosperity. It is especially true in case with e-Commerce, where design serves both as the shop window and a sales assistant. This is why e-merchants pay so much attention to the appearance of their website. However, in the quest for stylish looks it’s important that usability isn’t sacrificed. So, if you’re vague about which of the redesign options to choose, go for one that will ensure most profits. For example, do you know why you should consider getting rid of the sidebars, go for a monochrome theme or make your call to action button-like? The infographic answers these questions. And it’s not just the recommendations from seasoned UX experts for your website to look trendy in 2016. The guys present a juicy blend of the freshest 2016 design trends that are proven to boost the conversion rate. 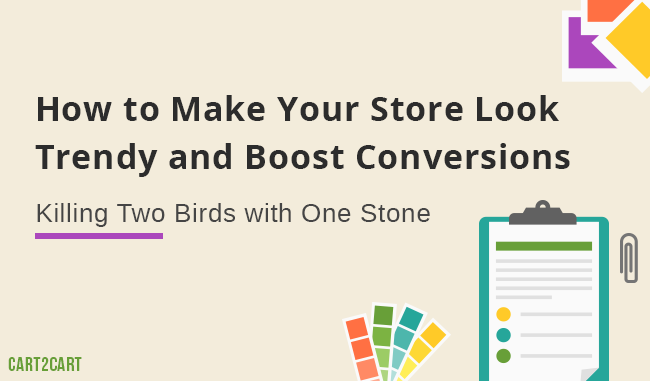 The infographic contains useful tips to help you both reach your goals and give your online store a refined appearance. Without further ado, help yourself to the treat. Well, now you’ve got the guidance on making your website not only breathtaking looking, but also more effective and spur more conversions by changing the seemingly unimportant UX points. Now that you know what to do, you must be anxious to get down to work. But if you’ve got your own recommendations and ideas, we’ll be happy to hear them in the comments section below.